It would be great if you'd buy via https://smile.amazon.co.uk and search for Lions to support our work. Same as using main Amazon website, with no cost to you, but we get 0.5% of your spend. Join Fleet Lions for Fun and Fellowship! Thursday 2nd May 2019 - Aldershot Centre for Health, Hospital Hill, Aldershot GU11 1AY. 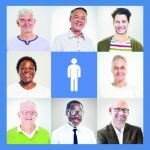 Prostate cancer is one of the biggest killers of men over 45 in the UK. One man dies every hour in the UK and early treatment saves lives. We are running this event in conjunction with Aldershot Lions Club. Get your test here. And it's at the Harlington again with your favourite bands and food. Such a fabulous event - it'll be lucky for everyone! More details here. We saw nearly 100 of you at the Hart Shopping Centre on 9 February & did some detailed checks without testing bloods. Quite a few people fell into the moderate and high risk groups & were given referral letters for their GP for more detailed medical assessment. Everyone was given leaflets targeted at their risk profile on what actions they should and could do to reduce the chances of developing this crippling condition. Click here for more details about diabetes. We organise some of the biggest events for the people of Fleet and neighbouring towns to enjoy. And quite a few of them need numbers on the day beyond the members of our Club eg it takes 120 people to put on the fireworks event. We'd like to have a group of people we can call upon to help us - and join in the fun too. So we're calling them the Fleet Lions Volunteer Team and we'll give people any training that they need. It's early days but we'd also like to make sure everyone also has a bit of play - not just work. So let us know if you're interested by using our contact us facility. Lions are the largest community service organisation in the world. We’ve just raised over £21 million to help protect tens of millions of children in the world’s poorest countries from measles. The men and women of Fleet Lions help local people and organisations where there is need. We organise some of the biggest events in the town to keep you entertained - and we have fun doing so! 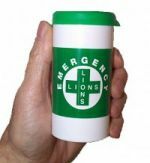 The Lions Message In a Bottle scheme is a simple idea designed to encourage people to keep their personal and medical details on a standard form and in a common location - the Fridge. Whilst it is focused on the more vulnerable people in our community, anyone can have an accident at home, so this scheme can benefit anyone, including you. More details here. Contact miab@fleetlions.org.uk if you need one/some. Motorcycle Rally and Concours is on 6 May 2019 at the Keys, Elvetham Heath. Beer festival is on 3 August 2019 at the Harlington. A major thanks to John Sutton of Clearwater Photography who followed us around for a whole year and then turned what he saw into this fantastic film. You the public voted us into THE SHORTLIST of the documentary section the Charity Film Awards.Many thanks to those of you who voted for us. Did the judges put us into the finals? Sadly they didn't but here's a comment from them ‘The video told clearly the surprising different work done by Lions and the charities which benefited not just financially but in practical ways.’ It was an honour to take part along with many other incredible organisations who serve their community too. Ordinary people doing amazing things! We hire out equipment for use at fêtes, etc. If you need to contact the Community Store please telephone 01252 616998 or use their form at www.communitystore.org.uk/_contact.html. Opening hours are limited so please see their website for full details. All the help is gratefully received - and hopefully you will enjoy the activity! Why not visit Hart Lions, our sister club in fleet? If you live in Aldershot, see Aldershot Lions' website.